Trying to delete locked files and folders under XP typically results in five-second-delays in which Windows retries to delete every second. This patcher removes this limitation by searching for all occurences of 56 57 33 FF EB 21 83 FF 05 in shell32.dll and replacing the 05 with 00. After doing that, the in-use error messages will pop up instantly. 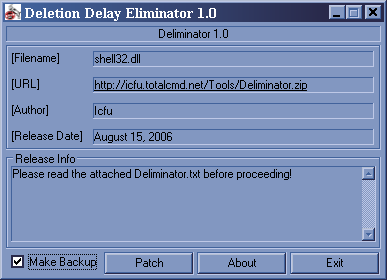 This patcher was inspired by the findings of Dan Farino: http://codeproject.com/system/NoDeleteDelay.asp Thanks!